You can never can have enough tools in your toolbox, both at home for your personal projects, and in the professional field. One of the more useful tools to have is a solid set of wrenches. If you are anything like me, you may have every wrench you need, but most are scattered helter skelter from various projects. A 3/4” here or a 20mm there. If it’s from a socket set, the bits are useless without the proper coordinating ratchet piece. Say you’re working on your car, and you go to grab a wrench, and the size you need is missing. DIY projects become useless when you reach for a size you need, only to find it is no longer where it was before. One of the utmost problems commonly presented – misusing your wrench sizes when the right size is not available, thereby damaging your set and requiring replacement. It can also result in bruising your hands and damage to the project itself. And let’s not forget the proper way to use a wrench – always pull, never push a wrench. Just like with over tightening and stripping of a screw with a screwdriver, a wrench has the same issues – over-torquing can present problems in removal and/or ruin the wrench itself. Let’s consider two of the most common types of wrenches – the combination wrench and socket wrench. 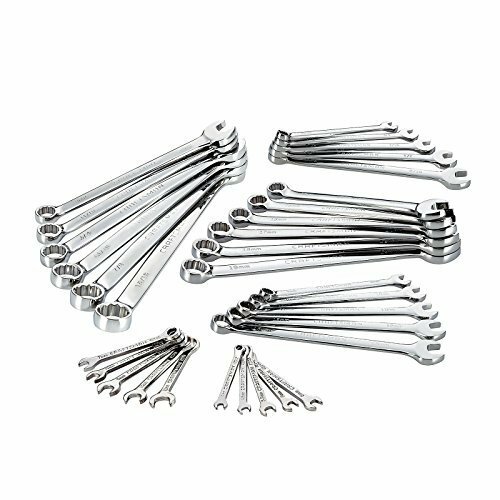 The more popular and conventional wrench is the combination wrench, which provides a fixed size per wrench. The combination wrench both measures in SAE (Society of Auto Engineers) and metric. Whereas the socket wrench depends on a ratchet with interchangeable sockets, and is also available both in SAE and metric. 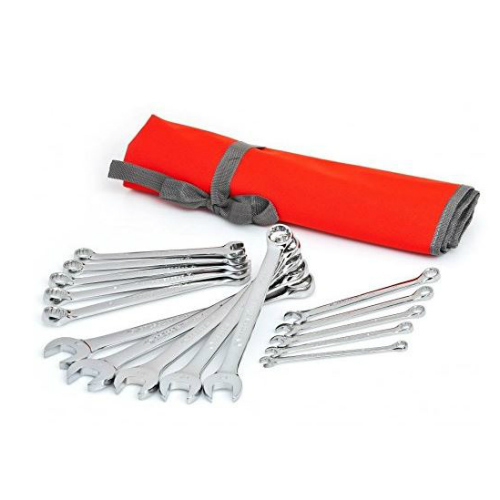 A socket wrench set allows you to be able to handle a variety of projects with ease. The most complete combination wrench set I’ve found is the Tekton Combination Wrench kit, which includes a store and go keeper in addition to the wrenches in the set. This set can be a very important addition for any tool collection, whether for your home collection or for a professional environment. In terms of quality, the premium vanadium steel (hard yet malleable transition metal) is made to withstand the harshest of elements, and will take a severe beating while still holding strong. Even after several drops on the cold concrete floor, I didn’t notice any noticeable scratches or dings. The wrenches were made to be given a rough handling, and to be able to handle tight spaces not easily assessable. The fifteen-degree angle on the open end allows you to get in between spaces without sacrificing grip or torque. There is more than enough room for your fingers to avoid the inevitable, dreaded scrapes easily had with other tools. On the other end of the wrench, the twelve-point box end grips onto the sides of the nut and not the corners. In the thirty-piece set, you can expect both the metric sizes as well as the SAE, or English, sizes. 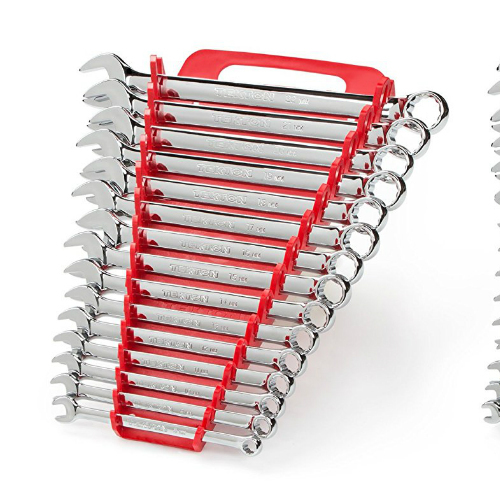 Each wrench is clearly marked with the size of the wrench and the Tekton logo. When finished their tasks, the wrenches can be stored in a plastic case that can either be mounted on a peg board or stored in a tool box drawer. This keeps them together, and avoids searching high and low for a particular size later on. As with most tool sets, the plastic case is a bonus piece, however, and is not made of the best quality – but keep in mind that you are paying for the wrenches, not the storage case. Tekton is a great brand with a large following. The manufacturer has a terrific lifetime warranty as well as top notch customer service. But chances are, you won’t need to use either. The only major downside I discovered was that the wrenches are not made in the United States and the holder does feel flimsy under the weight of a full wrench set. From the beginning when Crescent wrenches were building the Model T, this tool company has made dependable products for over a hundred years. The combination wrench has been growing with the company since its inception. With the Crescent kit, you get a fourteen-piece SAE or Metric wrench kit, and you may never have to buy another set. Each size is clearly marked and the alloy steel with chrome finish is heat-treated and made to last. The rugged design has an extremely solid feel in your grip and can loosen or tighten the toughest nuts and bolts. I found this set to be extremely versatile as well with the included soft pouch. Roll the kit up in its storage case and it can be stored in your truck, in your shop, in gear, or practically anywhere without taking up much space. Each size has an individual pocket in the storage case, thereby avoiding the entire set being strewn about during transit. This pro grade, high quality wrench is only available in either the SAE sizes or in metric, but not both. The price is a bit steeper than most, and as mentioned, only includes 14 pieces. Keep in mind, however, that what you spend in money, you save in impeccable quality, endurance, and long-lasting durability. If for some reason the product is flawed, all Crescent wrenches come with a lifetime warranty, and excellent customer service. And since they have been around for several lifetimes, the name speaks for itself. 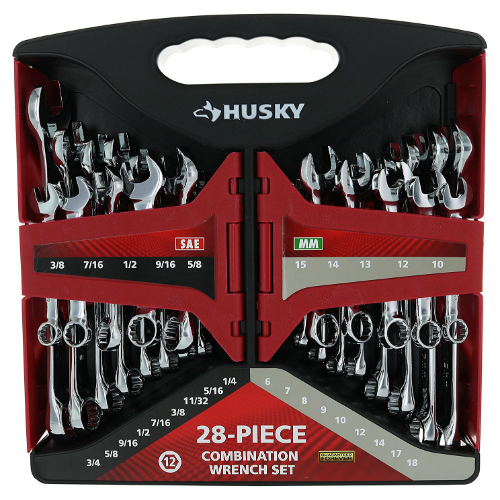 When it comes to both a high standard for quality and quantity for a terrific price, the Husky 28 Piece kit and Plastic Labeled Storage Case is the one. Both SAE and Metric wrenches carry the normal length as well as the smaller, “stubby”, wrenches perfect for smaller projects. Each wrench included is designed with a fifteen-degree offset allowing for access to almost any nook and cranny presented, and is great for all those tough and hard to reach spaces. This complete set comes with various sizes ranging from ¾” to ¼” in SAE and 18 to 6 mm and is packaged in a well-marked plastic storage case. As with other companies, the storage case is more of a bonus accessory, and it not made to be a permanent storage container. It does not live up to some of the other competitors on the market as the wrenches have a difficult time staying in place and the plastic tabs that secure them in place can break off rather easily. Sometimes, when the case is full, the closing tabs don’t keep each side secure resulting in the case opening, and the wrenches falling out. This can easily be rectified by keeping the wrenches organized in your toolbox or tool chest. Aside from the plastic case, however, the wrenches hold up quite well and remain in good condition. Working on a truck engine, for example, the wrenches carry enough torque to loosen tough engine bolts and tighten them again securely. The Husky kit comes in at a cheap price and is guaranteed “forever” by its manufacturer. Venture into many home improvement stores, and the Craftsman brand is one you will likely hear frequently and with confidence. Not only are they well known and have been the trusted brand by many, they are the go-to for any workshop or tool kit for a long time by many. With the Craftsman brand you always know you are getting reliable, top-notch quality, and a name you can trust. The wrenches included in the Craftsman 32 Piece Kit are no exception. The rugged alloy steel design delivers fast torque, and the durable lasting feel of each wrench will give you confidence that the tool will withstand some of the toughest uses you would need them for. Not only is the kit perfect for any personal tool collection, it is especially ideal for any auto shop or garage. Many of the sizes will fit spark plugs, and the larger wrenches carry enough torque for lug nuts and engine bolts. It does come with a storage plastic case, but since these wrenches are bulky and rugged, like with many other brands, the case is more of a bonus feature, and does not keep a secure hold. These mighty wrenches were made to be used and to be kept loose in a tool drawer or chest. With the etched size clearly visible and Craftsman name plainly marked, they will be easy to find when needed, especially in a pinch. Because Craftsman is no longer made in the United States, this has brought some negativity with the product now being made overseas. However, despite the change in local, the Craftsman brand still sticks behind it’s one hundred percent Forever Warranty and its dependable name. Its pricing comes in at the higher scale. If you’re like me, your wrenches do not necessarily always stay tethered to your workbench or in your garage. They go with you out on the road, and can be used in many situations, both personal and in the workplace. 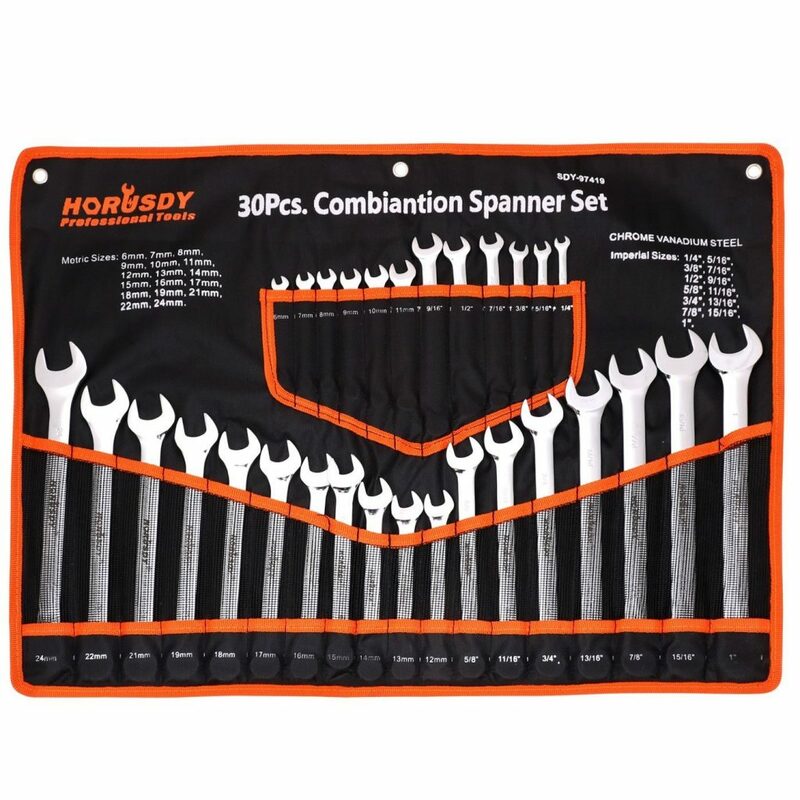 The Horusdsy 30 Piece set is a great set due to their versatility, and can be a very useful addition a jobsite, or as a backup set to store for an emergency. 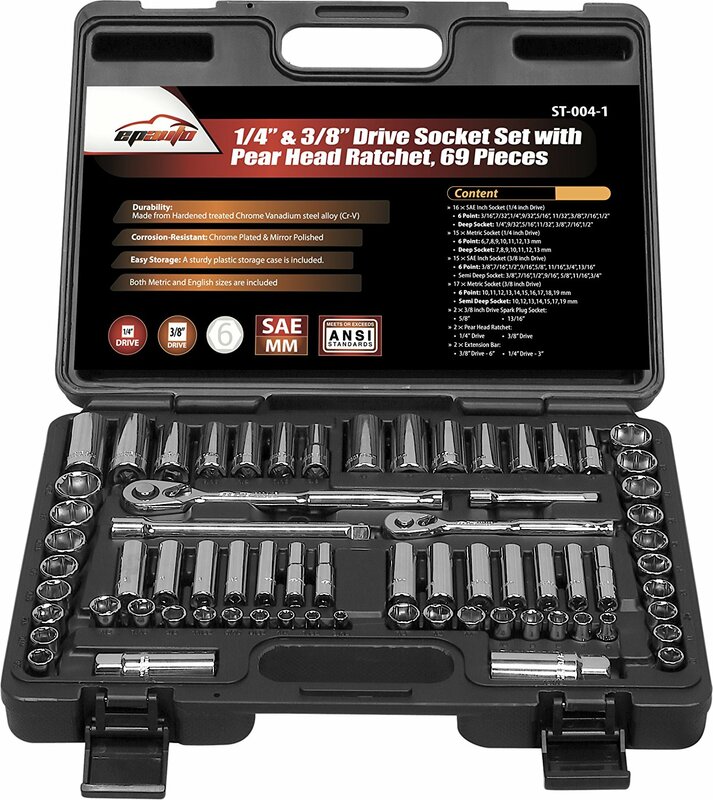 With both SAE and Metric sizes included, the set is the last set of wrenches you will need for a long lasting, dependable, and versatile set. Unlike other brands that include a sometimes shoddily made case to keep your set in, the Horusdsy kit comes with a cloth bag, which easily stores and marks your wrench set, providing protection to your tools with years of use. Each size on the pouch is written in white paint so that when you need to find the right wrench, it is right there and readily available. The set has many sizes included in its kit to offer, which proves to be a big help. As with most kits, the largest SAE size varies in availability. With this option, the largest SAE size is one inch while the metric sizes go all the way up to 24mm. This will come in handy for all types of various projects that have larger hardware. It comes with a manageable price. Since it can be difficult reading the sizes on the wrenches if they aren’t stored in the pouch, you might find yourself scrambling to find the right size come crunch time, so you will want to be sure to store the wrenches back in the appropriate pocket as a precaution. With the lightweight yet durable design and size for every occasion, this set will offer a helpful hand no matter where you might be, although it does not advertise a known warranty, which can be a downside to this useful set. Do you have yellow fever? If so, you may be thinking of the Dewalt brand. The yellow branding of Dewalt is well known even before the familiar name becomes visible, and is popular and easy to spot with the eye. The Dewalt brand carries a certain attitude - an attitude that says you expect nothing but the best for the money you are investing in its brand. With the Dewalt 34 Piece set you can’t do much better. The sockets included can be either used along with the included ratchets or with your power driver, giving you even more versatility. As with all Dewalt products, this set is built to last. No shoddy construction as these little guys can pack the punch and prove they are worth all their weight in gold. The set comes stored in a rugged plastic case, and they sit tight behind the yellow branding making it easy to find, with the individual plastic shelves able to be stacked in a tool drawer. Each case is also made to interlock with other Dewalt cases ensuring a tight, sturdy fit in storage. However, I have a feeling like with mine, your Dewalt case will be open most of the time as you use the 72-tooth ratchet to securely tighten and loosen bolts and nuts with many projects. With so many positivr reviews (and a few negative reviews here and there), you will feel great about incorporating this valuable addition to your personal and/or business collections. If there are any downfalls, it might be that the sockets aren’t necessarily deep and some of the sizes are known to have fit issues. But using these sockets on projects will give you the sense a majority of the time that the fit couldn’t possibly any tighter. You will feel the torque indeed. With a lifetime warranty, the Dewalt set comes in mid-range in pricing with an average and affordable price. Another popular and well-known brand of tools is the Stanley tool line. For a good, old-fashioned, and reliable go-to socket set, I found the set to deliver exactly what I needed without any extra, unnecessary frills or a fancy case. It is a durable product that comes from a well-known and dependable brand that will give both your personal collection or shop the sockets needed to complete any project. With the efficient ratchet design, it will give you fifteen percent more torque. This will translate with more secure fasteners and less slippage than some of the other, more expensive brands. Starting with the basic, yet reliable, 40-piece kit, Stanley also offers kits which include 50, 60, 85, 123, 145 and 201 sockets. When deciding on what sizes you need, the set offers a plethora of options to choose from without having too little or too many items. It is a comprehensive kit that includes a 3/8” spark plug socket for use in the garage. 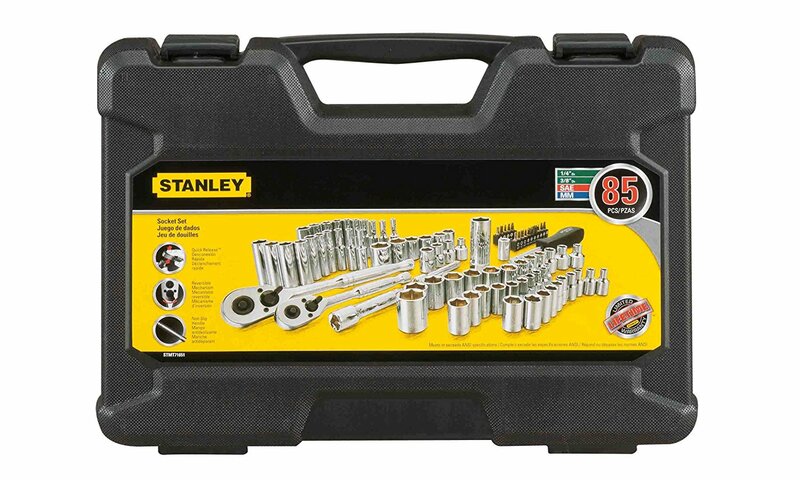 Also included in the Stanley 85 Piece set are both the three inch as well as the six inch ratchet extensions, options that many other sets do not include within their sets. This comes in extremely handy when needing extra length or the ability to get into harder to reach areas. I would highly recommend it as opposed to the 40-piece socket set or the 201-piece socket set as it gives you more variety of the sockets you would need on a daily basis without the hassle of scrounging for missing sizes (with the 40-piece set) or sorting through too many pieces (with the 201-piece set). Additionally, it comes with extremely useful screwdriver bits as well. Depending on the need and job at hand, you have many sizes to choose from. Even with the basic 40-piece socket set, you are limited to the projects you can use. However, the sockets included are incredibly dependable and appropriate for almost any job or project. Not only are they ANSI standard, the set includes sockets found in professional shops across the globe. 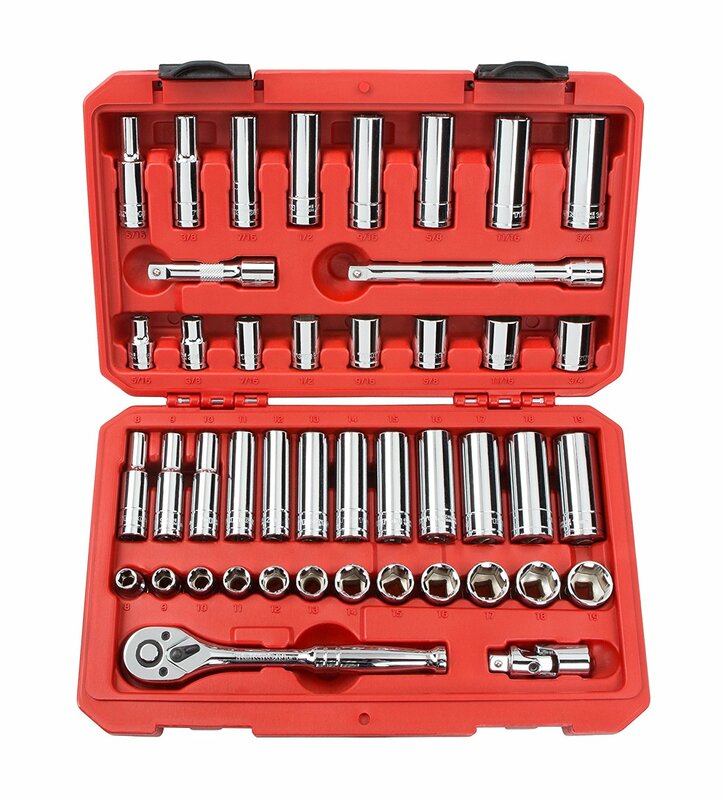 If you are looking for a reliable, high-quality socket set, I recommend that you look no further. The pricing on this product comes in at an affordable price, but on the downside, only includes a limited lifetime warranty. This comprehensive socket set from Tekton is versatile enough to be found in woodshops, auto service bays, and homes all over. None of the 45 socket parts included are unnecessary or redundant. Each socket is the ideal size needed to complete any project or job. Each of the 6-point sockets keep a locked grip on fasteners using the sides, as opposed to the corners. This ensures no slipping or lost torque. Just when you feel that you can’t possibly go any tighter, the ratchet keeps going, ensuring a tight fit. On the other side, when confronted with a difficult, over-tightened nut, I felt fully-confident that I could loosen it without maximum effort when using a socket from the set. The sleek design handles ensures that the sockets perform exceptionally. Also included in the set that I found was missing from other similar models was the inclusion of a universal joint, 6-inch extension rod, and a power socket adapter. With a lot of socket kits, I am often buying the universal joint separate at an additional fee. With this kit, I can use this adaptor to reach usually impossible bolts, and it is included in the price advertised. Using only a 5-degree turn, the bolt is easily loosened and it literally does not take much to move the socket. One drawback I did find during operation, however, was with the direction lever which comes included. It does not lock easily, and often would move during operation. The other drawback was that I could not use the bits with my impact driver. When you consider the cost which is decent, and the ample accessories and size choices that come with it, the Tekton 45 Piece set offers a versatile set to compliment any work setting. On the downside, although the warranty process is not completely specified by Tekton, it is guaranteed per their representative statements. This could be considered a downfall when compared to other products on the market. The Stalwart brand might not be as recognizable or carry the weight as some of the big boys in the tool industry, but the handy Stalwart 40 set will give you a ton more bang for your buck. Perfect for use on the road or as a supplemental kit, the Stalwart 40 Piece Socket Set serves its purpose as a lightweight tool for just about every situation. With both SAE and Metric sizes in a sleek plastic case, a ratchet from this set performs the task no matter how big or small the hardware is. While most of the sockets only fit the ¼” drive, when the need is called I found the torque in this set to perform admirably. The lower end pricing on this product makes it both affordable and usable. You can’t find a more dependable set for the cost of lunch anywhere. If the 40 pieces aren’t enough for you, Stalwart also offers a 52-piece set for only a few additional dollars more. The bargain with Stalwart products is real and it is worth it to have an extra set just in case. For simple projects around the house or on the go, the Stalwart 40 Piece Set comes in handy and can be counted on. The one downside to this product is a lack of a visibly defined warranty on the product. Another unheralded brand with a dependable product, the EPAuto 69 set seems to have it all, including every socket size you will need now or in the future. 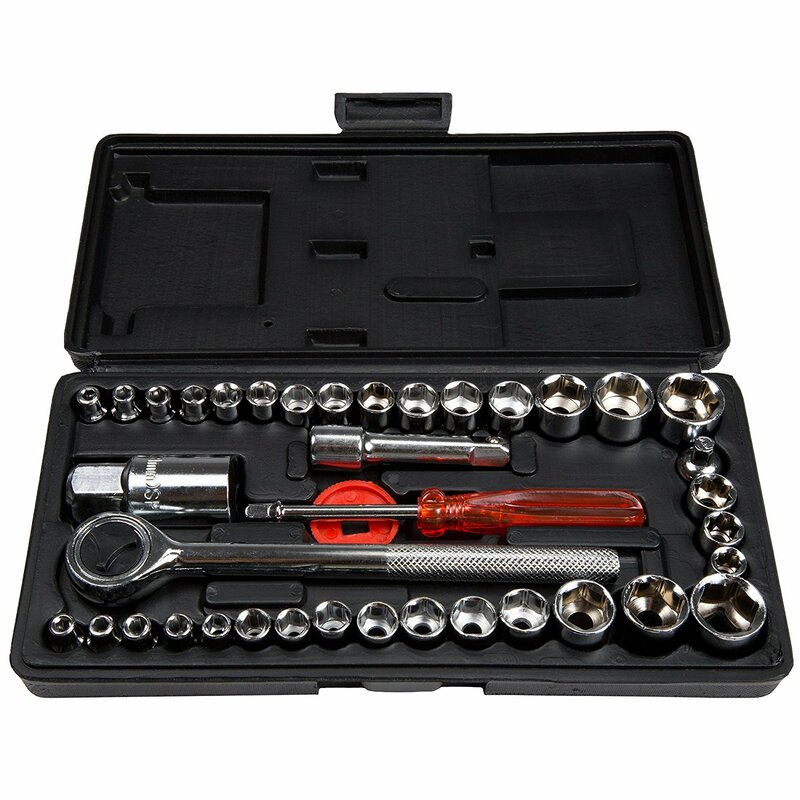 With almost 70 pieces arranged neatly in a heavy-duty plastic case, this kit provides years of dependability and reliable work. 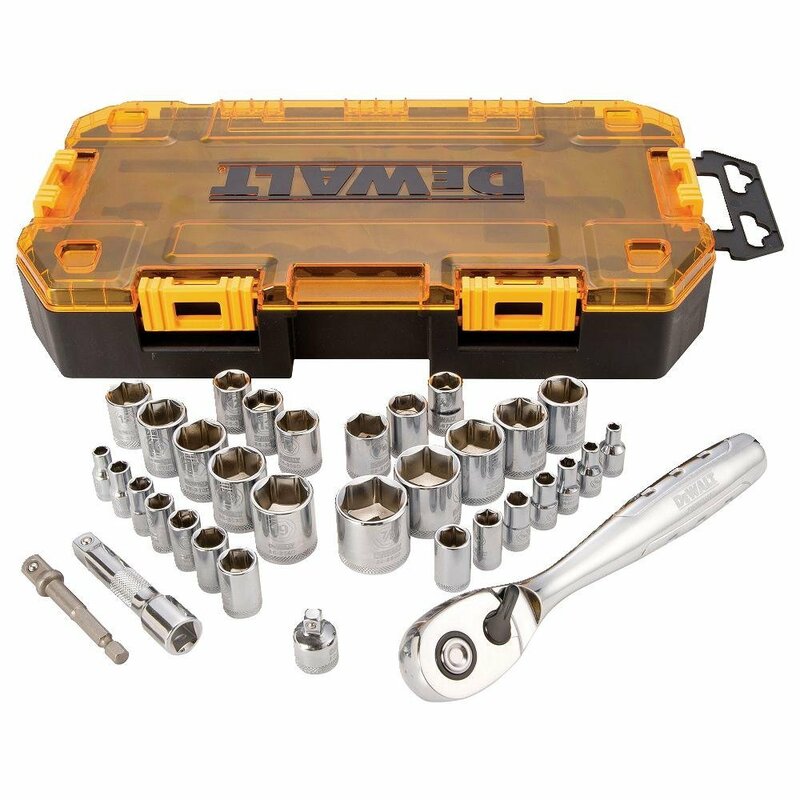 For those who need a more comprehensive socket set for the garage, this set comes with two extender bars measuring in at 3/8” and 1/4", as well as two 3/8” drive spark plug sockets – one at 5/8” and the other at 13/16”. Unlike many sets, this option comes with a very hand pearhead ratchet. It makes both a perfect beginner set, as well as a valuable addition to any work environment, consisting of comprehensive socket sizes for every task. Even if you are a simple DIYer, the EPAuto 69 set has any and every socket that you could possibly need. Although it comes with a case, the sockets loosen when the case is stood upright, and cause many of the pieces to fall out of place. On the downside, if you have big hands, this set may not be the one for you as the handles of the EPAuto 69 are quite slim. The price range averages on the mid to high price range, but does not include a warranty. Compared to similar products available on the market today, the lack of warranty combined with the higher price can be a considerable turnoff. Two extension bars - 3/8” and 1/4"
As with any tool or equipment purchase, when determining the right set of wrenches to purchase, there are many factors to take into consideration. Weighing the pros and cons of each product is quite helpful, but sometimes even that is not enough. Before even considering the pros and cons of a product, take a step back and think of the project(s) you will be working on, and what you will use these for with future needs. Maybe give this a little consideration – do you want to pass your tools down to other generations to use with the same gusto as when they were first purchased? Do you want your future generations to feel a sense of wonder and amazement when they hold a tool in their hand that was passed down? Or would you rather they go and purchase all new equipment because your tools have become rusted and abused with the simple passing of time? I know from personal experience the satisfaction and pride I felt when being gifted with my grandfather’s ancient toolset that was in mint condition due to the rugged nature of the tools and the long-lasting durability. The first thing to consider when deciding on your purchase is the type of wrench set you will need. Perhaps you want a variety of wrenches, but can only afford one set. Do you want a combination wrench set or a socket wrench set? Or maybe you can afford and want both a combination wrench set and a socket wrench set for various projects, but do you know if you want different sizes, or do you mind overlap? These are very important questions to ask yourself as you as begin to explore the options out there. With the many competing brand out there offering a variety of different sizes, its important to look at quantity included in comparison to other products. How many wrenches are included with the set you are considering? Does the set include enough items that you do not need to purchase a companion set to replace any necessary pieces not included? Is this something you will be able to utilize on future projects, or will you be limited? Quantity is not always rated a top priority, but when you get started on your projects, and only have limited wrenches to work with, you may rethink your smaller set. One of the most important things to debate in any purchase, especially in tools, is the quality of the materials being purchased. Are the wrench sets being considered designed to last and are durable? Or are they made of subpar material that keeps the cost down, but will require replacement after a short amount of time? If you’re like most, you want a product that will last a long time, and don’t look forward to having to replace a piece due to shoddy production value. Cost, quantity and quality go hand in hand and should play a very important part in your purchase. Will you be paying for the brand as opposed to the quality, or is the name of the brand more important to you? Are you getting a good value for the quantity of wrenches included with the kit you are purchasing? You may be looking at a phenomenally priced tool set, but if you haven’t taken a step back and asked yourself if they are they made to last, you could be making a purchase mistake. Finally, the warranty on the product should be one of the top items to consider before settling on just any tool set, wrenches included. In the long run – who wants to replace their tools? But it happens, and with a strong and functional warranty in place, the investment makes sense. Consider the following – does the manufacturer include a lifetime or limited warranty? Does it give you a shady definition of what the warranty is, or is it explained well? Or maybe the set doesn’t include a warranty at all? Who wants to purchase a set of tools, only to have them break and not be returnable or covered under warranty? Not many people I know. Just like with any tool set, doing your homework thoroughly and choosing a wrench set is just as important as researching the product your buying first instead of just randomly purchasing the cheapest option that becomes available. If you are purchasing the tools for your own personal usage, take into consideration how often they will be used, what you will be using them for, and how you will treat your new tool set. Likewise, for business purposes, keep in mind that if you purchase solely on price per tool and not reliability, you may be quickly replacing the wrench set you invested in and spending more money overall. With the changes in current manufacturing standards nowadays, tools may not be made as durable as they once were. But with the right amount of due diligence, you can invest in a product that will serve you well.